Many California wineries produce a good bottle of Zinfandel wine, but our center of the Zinfandel universe resides in Lodi, an appelation nestled in California’s Central Valley. One of their stars is Klinker Brick Winery, producers of Rose, Syrah and Old Vine Zinfandel. Lodi is home to over 80 wineries producing wonderful Zinfandel and Syrah. You owe it to yourself to visit, as most tastings are complimentary, and the wineries are centralized around the city of Lodi. While it is not as easy on the eyes as Foxen Canyon, Paso Robles or Sonoma, it is a quick drive between wineries and their estates. The wine community sits 36 miles south of Sacramento, 16 miles north of Stockton, bounded by the foot of California’s Sierra Nevada Gold Country on the east, and the Sacramento River Delta on the west. According to the Lodi Winegrape Commission, grapevine is a native plant in the area. Early explorers found wild grape growing along rivers and streams, and one stream was called ‘Wine Creek,’ though later renamed Calaveras River. The first vine was planted in 1850 and by 1858 the first winery, El Pinal Winery, started wine distribution. But wine was not the product locals focused upon. Local farmers found growing grain and watermelon to be more lucrative until the late 1880s when the market collapsed for those products. Looking for new lucrative agriculture products, local farmers found Zinfandel and Tokay grapes grew well in the sandy soils and cool Delta breezes. Klinker Brick Winery farms grape from old plantings. 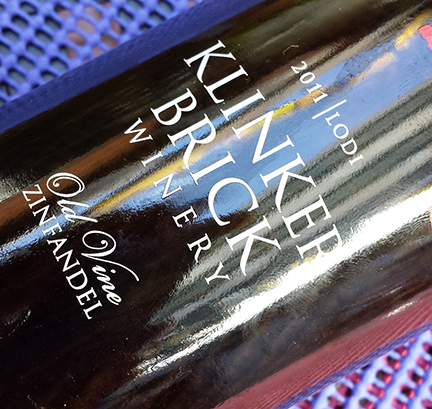 While the company is not as old as their vines, Klinker Brick produces wine from vineyards in the Mokelumne River Appelation of Lodi and the Clements Foothills, coaxing wine from ‘old vine’ growth between 40 to 120 years old. Grapes from ‘old vine’ produce smaller amounts of grape, on average 2-3.5 tons per acre. This small volume of grape is generally thought to be of a better quality, for a better bottle of wine. The central valley is full of old vines. In California there or two camps, two types of wineries. The first type of winery is the Monument Winery, the wine estate with a monumental building, pillars and statues framing their tasting room. These wineries are a visual feast for the enjoyment of wine. The second type of winery is the Farmer’s Winery, a simple building, with a tasting room and wine. Because after all, growing grape is farming. You are growing produce that a winemaker turns into a bottle of wine. Klinker Brick falls into the second category, a Farmer’s Winery. Their tasting room looks to be a converted barn, nicely furnished and comfortable in the middle of farmland. We enjoyed our visit at the end of a busy day. You’ll find their wine to be fruitful, yet balanced, with higher alcohol content. Visit this area and savor their wines, exploring one of the many appellations producing interesting California wine. You may find their wine distributed widely, both Total Wine and BevMo carry their product. This entry was posted in California Wineries - New World Wines, Lodi AVA - Home to 80 Wineries, The Pleasures of Tasting Wine, Zinfandel and tagged bottle of wine, california, lodi, syrah, wine tasting room, zinfandel.